Please refer to our stock # TR754 when inquiring. When anyone looks at this classic 18Kt yellow gold broach, there is no mistake recognizing it as an original Tiffany and Company design. 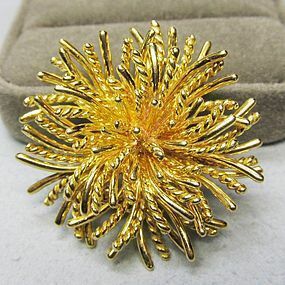 The sea anemone pin was created in the 1970’s, and presently it is not listed as available on the Tiffany web site. The diameter of the broach is 1 ½ “and it is made of solid 18Kt gold, which makes it quite substantial. The double pin makes the broach sit well on any piece of clothing.